A performance of Then singing and Tinh lute in a Lang Son festival. The Then singing - Tinh gourd lute class for disabled people living in Lang Son City and neighboring districts is organized by the Lang Son Culture and Art Center and the provincial Disabled People Association. Dam Thi Na, whose legs have been paralyzed since she was small, has participated in the class for a long time. “All members of the Disabled People Association love the club for Then singing and Tinh gourd lute. The art form has encouraged us to overcome life’s difficulties. We know that it is one of Lang Son’s traditions and needs to be preserved and promoted. I want to learn to sing the wonderful Then songs and participate in exchange programs with neighboring localities,” said Na. Then singing in Lang Son is famous for having joyful, jubilant melodies. Throughout the region, Then is previously sung and the ancient Tinh lute is played at religious rituals, spring festivals, and ceremonies to pray for rain, bumper crops, and the maturity of young men. The lyrics of the ancient and new Then songs are simple and very close to daily life, use onomatopoeia, and feature love of nature and homeland, romantic love, and hope for good weather. Singing Then songs and playing the Tinh lute isn’t easy even for ordinary people, let alone the disabled. 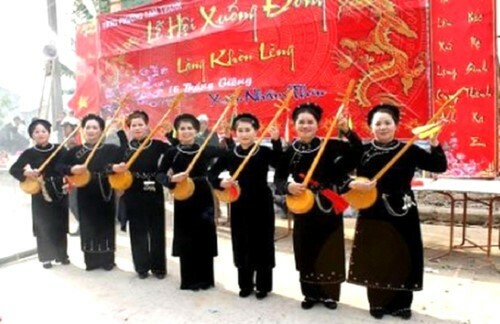 In recent years, regular Then singing and Tinh gourd lute festivals have led to the establishment of hundreds of Then singing clubs in Lang Son.